What is this packing light you speak of? I just don’t “get” people who manage to pack light. Even when I travel to the family lakeside cottage less than two hours from home, I manage to fill an entire minivan with vital stuff I simply cannot live without. The lifelike qualities of the Architextures mixed media embellishments almost demand a new kind of altered art tag. You can see my unique answer to that call on the 7gypsies blog. Look who is pretty in pink. More importantly, look who is strong in pink. Canvas Corp is featuring my Girl Power tag and tutorial on their blog today. I recently published the tutorial for this Miniature Inspiration Cabinet on the Canvas Corp Brands Blog. In it I offered this Free PDF of Inspirational Sayings that you can print onto the 8 x 8 Ordre du Jour notebook page. Use a light-adhesive masking tape to adhere two sheets of the Ordre du Jour notebook-looking paper to the top right corner of a blank 8.5 x 11 inkjet paper so that you can run the paper through your inkjet printer. I created a free pdf of inspirational sayings that you can use to print onto the Ordre du Jour sheets. Please make sure you run a test page on your own printer for alignment before using one of your Ordre du Jour sheets. Combining altered books and Halloween–does life get any better? 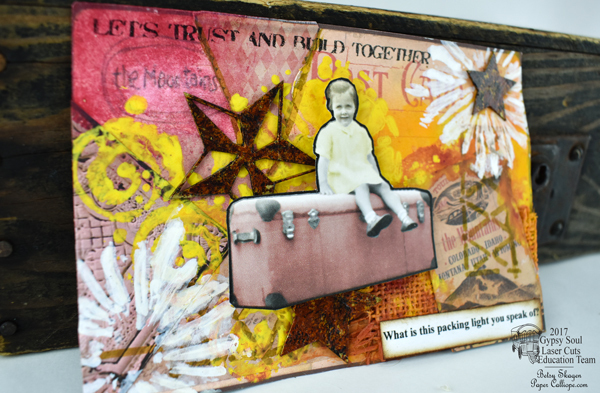 It does when your altered art album gets featured on the Canvas Corp blog! Please stop over and check out my tutorial (and my first-ever video explaining how I used magnets in the book).